New York Times bestselling author Susan Mallery shares a free recipe every week. All recipes can be found as printable PDFs at www.susanmallery.com/recipes.php! You can get a printable version of this recipe at www.susanmallery.com/recipes.php - plus lots more free recipes! Summer has been slow to come to Seattle this year, as it is every year. While other parts of the country talk about trips to the beach, we crane our necks looking for a hint of sun peeking from between the clouds. Seattle finally got a little bit of sun this week, and it’s thanks to me. (You’re welcome.) This weekend, I decided that summer needed a little encouragement, so I came up with a recipe for Tomato-Basil Salad with Molasses Vinaigrette. Summer in a bowl. I had never even heard of molasses vinaigrette before. I have since found some recipes online, so clearly I wasn’t the first person to think of this delicious combination. The vinaigrette has a slightly smoky flavor. One website said it tastes great on spinach salad, and that sounds true to me. 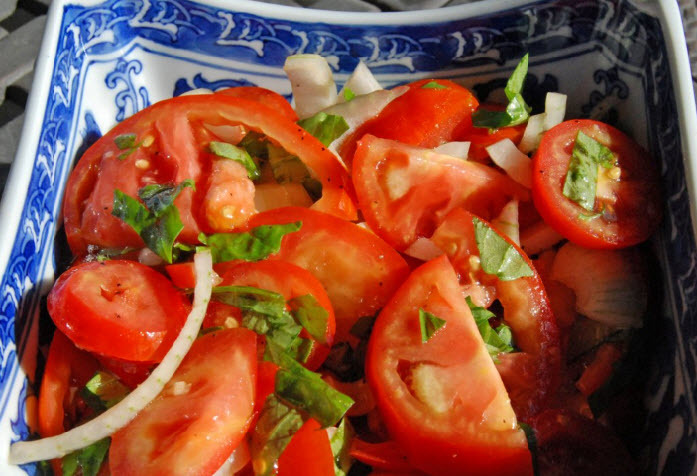 Put the tomatoes, onions, and basil in a bowl. Combine the vinaigrette ingredients, then pour over the vegetables. Toss lightly to coat. Allow to marinate for at least half an hour. Serve cold or at room temperature. Oh, that sounds good. It did take me aback at first, but I do a maple dressing for a Fall salad I make and it was delicious - sweet but not too sweet with the other ingredients. I'll have to give this a go especially considering most of the ingredients are on hand in the summer! I started out as a reluctant cook. I love delicious food and hey, someone’s gotta make it. In my house, that’s me. So I cook, and I’ve learned to enjoy it. Sort of. If I win the lottery, my list of must-have luxuries will still include a personal chef. All of the original recipes will be available in the free Members Only section at susanmallery.com.